DuPagePads clients often have health conditions that are intensified by homelessness. Not having stable housing, being food insecure and experiencing harsh weather conditions all negatively impact people’s health. When these conditions are not managed properly, participants end up using emergency rooms. Not only is the client’s health suffering, but it is more costly to taxpayers than if the client had been regularly receiving primary care from a physician. This is a six-week, chronic disease self-management series to empower participants manage their own care. This program ultimately assists clients in improving their quality of life. Participants in the program reduced their number of emergency room visits from a total of 24 in the six months before the series, to 5 visits in the six months after the series. Midwestern University is offering dental and vision screenings for DuPagePads clients. 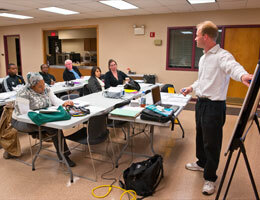 Earlier this year, DuPagePads Supportive Housing program began a partnership with BrightStar Care. Households in Supportive Housing have a disabling health condition, so these services are critically needed. This program provides short-term housing for those who are homeless and need bed rest. Last year this program served 85 individuals and 58% of households are now in stable housing or have a housing plan. Additionally, DuPagePads partners with 50 health and social service agencies. Case managers directly contact these partners and make a referral to ensure clients receive the care needed.